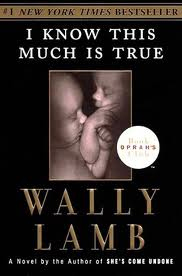 When I finished Wally Lamb’s I Know This Much Is True, I knew I had experienced another epic tale whose characters – their struggles and triumphs – would stay with me long after the book’s closing words. Lamb opens with a man’s burden – in this case a twin brother – of caring for a family member who is mentally ill but doesn’t want to get better. Lamb’s insight into this complex dichotomy of instinct – to want both to protect the weak and ensure self-preservation – struck so early that I wondered where in the world he might go for the rest of his lengthy narrative. As it turns out, there was much ground to cover; the journey Lamb laid out was moving, honest and for me, captivating. For most of his life, but certainly since the death of their mother, Dominick Birdsey has carried the burden of protecting his (older by minutes) twin brother, Thomas, who is paranoid schizophrenic. But when Thomas draws national attention for hacking off his hand in a public building in protest to the Gulf War, Dominick’s control over Thomas’ life is ripped away, and the only way Dominick can help Thomas is to turn inward and examine his own demons. Central to Dominick’s struggles with his past is learning the identity of his father as well as coming to terms with the only father he has known – his stepfather Ray, an abusive ex-military-type, who is top of the list among those Dominick has tried to protect Thomas from. The second half of the story picks up a parallel narrative, a personal memoir of Dominick’s grandfather (and namesake). From what he’d thought was a lost piece of family history, Dominick is able to fill in the blanks left by a mother who talked little of her own past and history. In doing so, Dominick can break free from assumptions he’s held on to about who he is and pursue the life he’s always wanted. Like Lamb’s previous main characters (Caelum Quirk in The Hour I First Believed and Dolores Price of She’s Come Undone), Dominick is fully developed and far from perfect. His struggle for identity – fighting against what he most fears (being like his brother) and feeling incapable of what he most wants (the love of a soul mate and a healthy parent/child relationship) – will capture the heart of anyone who has ever felt ill at ease in their own skin. A most rewarding read that ends with the hope that blooms from surviving.